New Customers | Min. deposit £15 (no Skrill / Neteller) | Bonus amount is 100% of 1st deposit, 50% of 2nd and 25% of 3rd deposits | 35x deposit and bonus rollover in 15 days for bonus winnings release | Bonus for wagering, deducted upon winnings release | Withdrawal limitation | Terms apply 18+ The .. 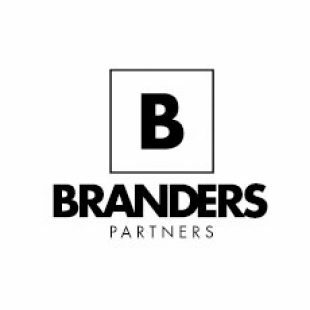 The brand 10Bet was founded in 2003 and is owned by 10bet LTD Casinos. 10Bet Casino has an international focus and is available in many languages including English, German, Swedish, Norwegian, Finnish, Portuguese and Japanese. 10Bet is regulated and licensed by the Maltese Gaming Authority and is the official betting partner of VfL Wolfsburg. In 10Bet Casino you will find casino games by popular providers including Quickspin, NetEnt, Pragmatic and Microgaming. Besides this 10Bet is home to the great Evolution Live Casino which holds the best live betting games including Blackjack and Roulette. And with more than 60.000 monthly sports events, via web or mobile, the 10Bet Sportsbook is one of the most popular around. Sign up now at 10Bet Casino and collect a 200% Welcome Bonus up to €300,-. Besides that you will receive 30 Free Spins on Starburst thought the live chat. Click here to register your free account today! Since a long time 10Bet has a strong focus on the Sportsbook section. With more than a decade of experience and 60.000 monthly sports events 10Bet has launched itself as one of the premier sports betting options worldwide. At the moment you will find a wide selection of top events in the 10Bet Sportsbook. Some of the most popular events are the NBA, NHL, ATP Finals, WC’18 Europe Qualifiers and the WC’18 Playoffs. Besides this 10Bet offers a wide selection of other (live) sports including American Football, Boxing, Darts, Golf, Ice Hockey and MMA. At 10Bet they don’t only focus on supplying you with the largest amount of sports events. They also have a strong dedication on bringing you the most user friendly Sportsbook on the internet. When entering the 10Bet Sportsbook you will always find a full overview of the highlights of the day, live sport events and interesting last minute bets. Besides this you can easily find events and sports by filtering or by using the search function. Because of this placing single bets or complicated combo’s only takes a few seconds. While betting on some action you can also cash out during the events to ensure a win. And while using your smartphone or tablet 10Bet also has something great for you. Simply download the 10Bet App for the best betting experience on your mobile device! 10Bet accepts players from all around the world including some grey markets. Residents from the USA, Turkey, Portugal, Spain, Hungary, Gibraltar, Belgium and France are restricted from playing at 10Bet. New players can now collect 50% Sportsbook Bonus up to €200,-. All with all the 10Bet Sportsbook offers a large amount of events, a generous first deposit bonus and decent overall odds. Because of this we can recommend the Sportsbook section of 10Bet. 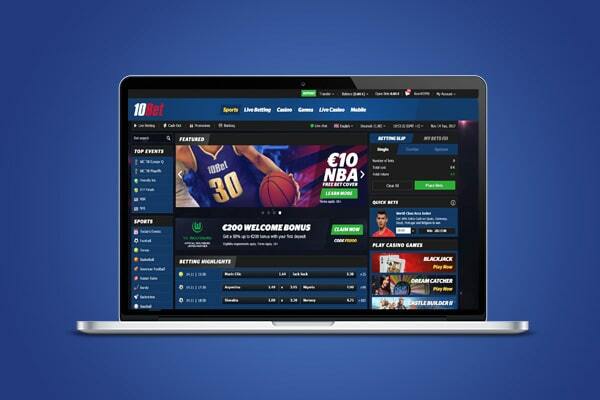 Nowadays 10Bet is more than a Sportsbook only! At 10Bet Casino you will find an interesting selection of online casino games. When you are interested in the 10Bet Casino you can collect a generous 200% Deposit Bonus up to €300,-. Besides this 10Bet will add 30 Free Spins to your account when requested through the support department. With your bonus you will get access to an exciting mix of the best casino games including slots, tablet games and live casino games. At the moment 10Bet Casino is home to a full section of games by providers including NetEnt, Microgaming, iSoftBet, Playson, Ainsworth, Pragmatic and Quickspin. In the gaming lobby you will be able to find your favourite games by filtering on provider or using the search function. You can also decide to filter the games by using the categories. Because of this it is always fairly easy to find your favourite slots, table games and jackpot slots. Besides live sports betting 10Bet also offers a state of the art Live Casino. In the live casino, offered by Evolution Gaming, you will find the best live entertainment on mobile or desktop. Simply open the Live Casino to get access to live Roulette, Blackjack and Baccarat Games. At the moment 10Bet also offers some speciality games including the Dream Catcher game and Casino Hold’em. Curious about the full range of casino games at 10Bet? Then sign up your free account on this page! At 10Bet you will find separate bonuses and promotions for the casino and Sportsbook section. Depending on what you want to play you can deposit money in the casino or sportsbook. When making your first deposit you can collect a generous welcome bonus. And after collecting this bonus 10Bet offers you multiple more exciting promotions and events. Below we highlight some of the important bonuses at 10Bet. Collect a €150,- deposit bonus by making a €75,- first deposit. You can enter 10Bet Casino with a total balance of €225,-. Make a €100,- deposit and collect a €200,- money bonus. In this case you can enter the casino with a total balance of €300,-. Collect a €300,- money bonus by making a €150,- deposit. In this scenario you can start playing in the casino with a total balance of €450,-. With this one-time deposit bonus 10Bet wants to welcome you in their casino. If you want to collect his bonus you will need to keep track of some rules. Please note that you will need to deposit with the bonus code 200WB to collect this bonus. Only deposits of €20,- or more will qualify for this welcome bonus. This bonus is only available once and for new players. You will need to wager your deposit and bonus amount a total of 35 times. Check out the terms and conditions on the 10Bet website for a full overview of all the rules. Ready to collect your bonus? Then sign up your free account on this page. After making a minimum deposit of €20,- you can also collect 30 Free Spins on Starburst. Simply deposit and contact the customer support department to collect your spins. The spins will be added instant on request though live chat or within one day when requested though email. This free spins promotion is only valid for players who deposited with the bonus code 200WB. Please note you will need to play your free spins within 7 days. Otherwise they will expire. Each spin has a total value of €0,20 and all winnings will need to be wagered 35 times. Have a look at the bonus terms and conditions to read more about all the rules. When you start playing at 10Bet you can collect a welcome package up to €1000,-. With this first deposit bonus you can collect your first bonus up to €200,-. Once you collected this bonus you can reload you balance with a 50% deposit bonus up to €300,-. Please make sure you deposit using the bonus code 300SECOND. Once you collected these bonuses you can collect a final deposit bonus (25%) up to €500,-. Make a third deposit using the bonus code 500THIRD to collect this offer. The minimum deposit for all of the bonuses is €20,-. Deposits via Skrill or Neteller will not qualify you’re the bonus. Navigate to the 10Bet website by clicking this link. Start signing up your account by filling in some personal details including your name and address. When you did this you can choose your 10Bet username and password. When ready fill in your security code and accept the terms. Click ‘’Join’’ to continue. Open the inbox of the email address you have filled in. Verify your account by clicking the activation link in the message 10Bet has send you. Fill in the amount you want to deposit, choose your currency and choose if you want to deposit to the casino of sportsbook. Choose ‘’Sportsbook’’ to collect the 200% 10Bet Deposit Bonus up to €300,-. Fill in the bonus code 200FD and click deposit. Once you finished your payment the Sportsbook bonus will be activated. Your 50% deposit bonus will in your account after just 1 rollover. Please note that the maximum bonuses and minimum deposits are different for euro’s, dollar and pounds. Deposit at least €15,-, £15 or $20,- to trigger the 10Bet Sportsbook bonus. The maximum bonus is set at €200,-, £200 or $250,-. To be eligible for this deposit bonus, your qualifying deposit amount must be rolled over once on settled sports bets with odds of at least 1.60. Please have a look at the bonus terms and conditions so you have a full understanding of the bonus rules. While playing at 10Bet you can expect more weekly or one-time events and promotions. Below we will highlight some of the most popular weekly events at 10Bet. Weekly Cashback; At 10Bet you can collect a weekly cashback up to €100,-. Simply play mobile slots from Wednesday and Tuesday and you will receive a 10% cashback each Wednesday. Sunday Special; During this promotion 10Bet will award loyal members with extra free spins. Depending on the amount of money you deposited between Monday and Saturday you will receive up to 80 Free Spins on Sunday. Your Free Spins will be available on the NetEnt slot Dead or Alive. Weekly Wonders; The Weekly Wonders promotion changes every day! Simply log in to your account and check out which bonus you can take today. With the daily promotions you can easily collect free spins, more bonus money and a share of large prize pools. Besides these casino promotion Sportsbook players can join exciting events which are based on active sports events across the world. Simply check the promotions page to have a look at all the current events. Ready to collect your bonuses at 10Bet? Then make sure you make your first deposit with the right bonus code. At 10Bet you can make a deposit using one of the many available payment methods. Some of the available options are Neteller, Visa, Mastercard, Skrill, EcoPays, PaySafeCard and Bank Transfer. All methods are instant accepts bank transfer. This option can take 2 or 3 business days. You can deposit from as low as €10,- without paying any fees. Only when depositing with bank transfer it is possible that your bank asks a fee. When you want to withdraw money you can do this free, which is pretty generous. Withdrawals to a credit card can take between three to five working days. You can withdrawal money from as low as €10,-. At the moment 10Bet has a maximum withdrawal amount of €50.000,- for regular accounts. Check out the banking section for more information about the fast and convenient payment options at 10Bet Casino! When you have a question you can open a live chat connection. Through this chat you can ask your questions to one of the many support agents. The live chat is available 24 hours a day 7 days a week. You can open the live chat by clicking the green cloud next to the languages switch. Besides the live chat 10Bet has more contact information details on their website but their a bit hidden. When you have a question you can also decide to email it to csd@support.10bet.com. When you prefer to call you can also ring +359-24925973 to reach the 10Bet customer support department. 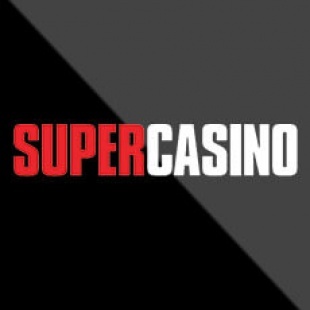 During this 10Bet Review we have had a look at different parts of the Casino and Sportsbook. All with all we are pretty impressed by 10Bet. Below we will give you a short summary of our findings. 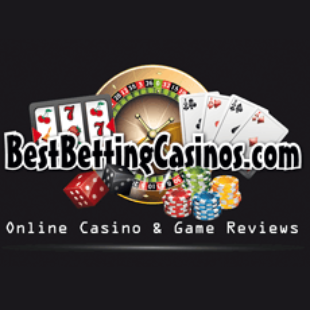 Sign up your free account today to try out this casino yourselves. Games; With 60.000 monthly sports events, a live casino and multiple great slot providers you will never get bored at 10Bet. 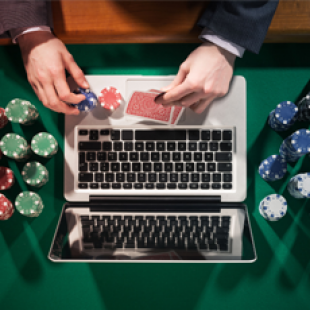 Both the Sportsbook and Casino offer enough content to play for hours! Bonuses; At 10Bet you will find generous welcome offers for both the Casino and the Sportsbook section. Besides this 10Bet offers multiple fun weekly promotions and sports events. Support; As a customer at 10Bet you can enjoy high quality support 24 hours a day 7 days a week. Simply open the live chat or email / call the customer support department to get in contact. Banking; At 10Bet you can withdrawal or deposit from as low as €10,-. This is very customer friendly and how it should be. Withdrawals are free and most payments are instant. All with all we think 10Bet is a very interesting platform for both Sportsbook and Casino lovers. We could not find any cons of the platform. Because of this we can really recommend 10Bet to all our visitors. 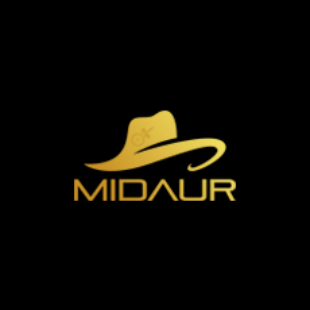 Ready to try out this gambling platform? Then sign up your free account today! Sign up your free account, deposit and collect a 200% welcome bonus (€300,-) + 30 Free Spins! Great Live Casino available (Evolution). Mobile Friendly website + convenient 10Bet Casino App. 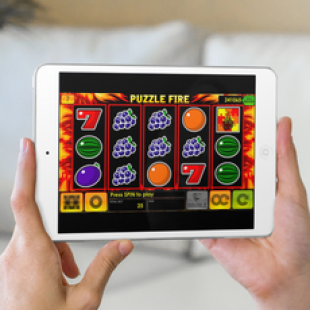 Multiple provider including Quickspin, NetEnt and Microgaming. Generous welcome offers for Sports and Casino. Quick and free deposits and withdrawals. Over 60.000 monthly sports events. Cash out during live events for guaranteed wins. Customer support open 24 hours a day 7 days a week. Exciting weekly promotions and one-time events. Residents from the following countries are restricted from playing at 10Bet; USA, Turkey, Portugal, Spain, Hungary, Gibraltar, Belgium and France. 10Bet is regulated and licensed by the UK Gambling Commission, the Malta Gaming Authority and the Curacao eGaming Authority. 10Bet is available in Chinese, English, Finnish, German, Italian, Norwegian, Portuguese, Spanish, Swedish, Romanian, Russian, Japanese, Korean and Vietnamese. At 10Bet you use one of the following currencies; Australian dollars, Canadian dollars, Euros, Hong Kong dollars, Japanese yen, British pounds sterling, Denmark kroner, Malaysian ringgits, Norwegian kroner, Polish zlotys, Singapore dollars, Swedish kronor, US dollars, Russian rubles, New Taiwan dollars, Vietnamese dong, South African Rand and Chinese Renminbi. At 10Bet you can deposit money in your account using Bank Wire Transfer, MasterCard, Paysafe Card, Visa Electron, Visa, Neteller, Ukash, Visa Debit, Skrill, WebMoney or EcoCard. At 10Bet you can withdrawal money using Bank Wire, ECO Card, Neteller, Visa Debit, Visa Electron, Visa, Skrill, MasterCard or WebMoney. Sign up your free account, deposit and collect a 50% Sportsbook Bonus up to €200,-.